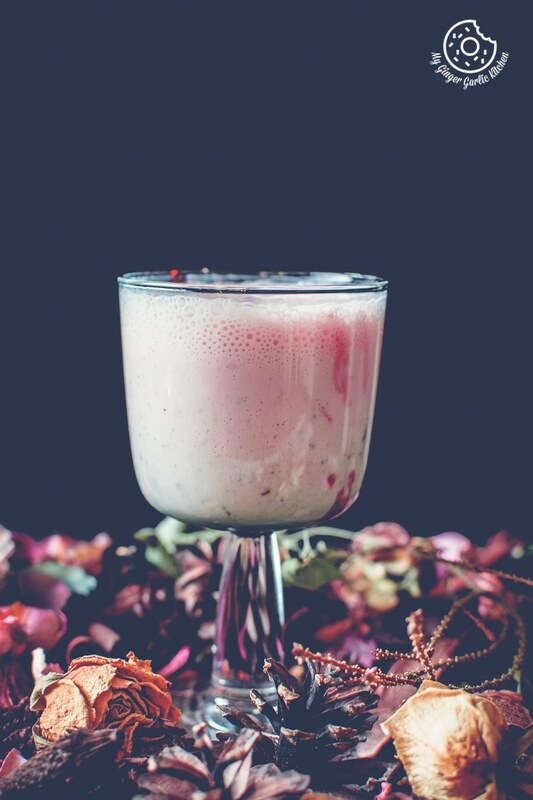 Gulkand Lassi aka Rose Lassi is a revitalizing drink. Lassi is basically a yogurt-based smoothie. 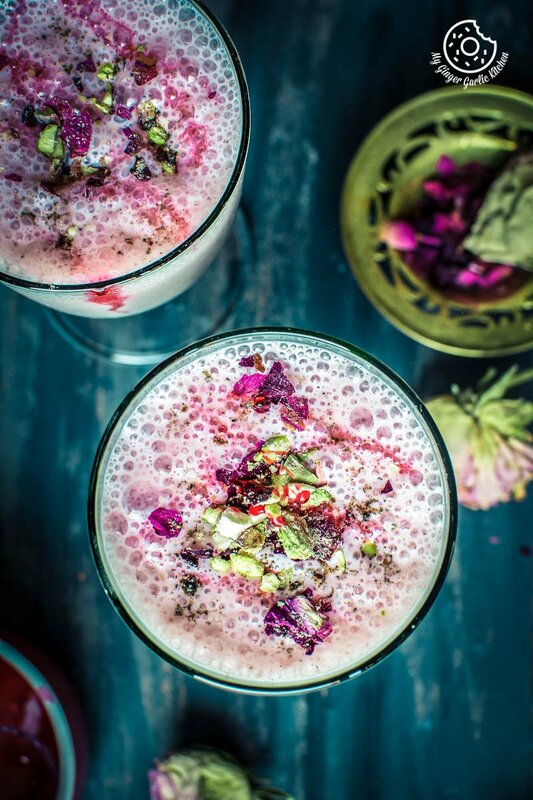 This sweet and rich, bracing and classic gulkand lassi is made with rose syrup, gulkand, milk, yogurt, and some hint of aromatic cardamom. Do you like any type of lassis? Do you like rose flavours? 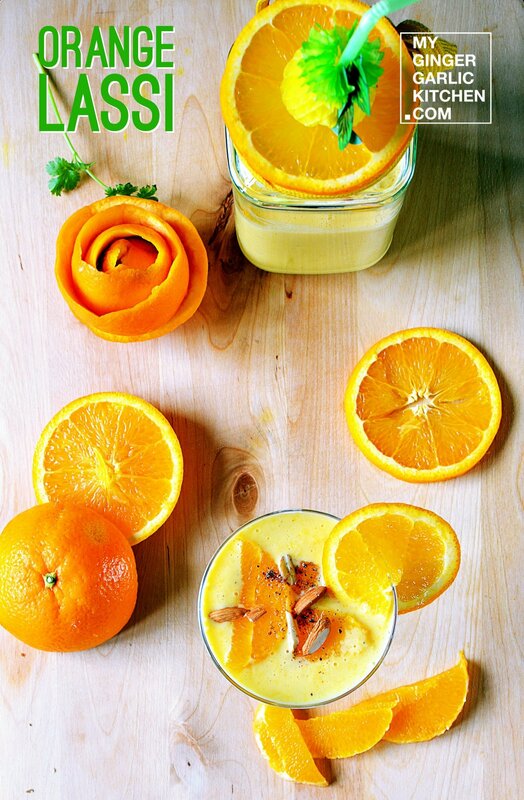 Then this refreshing and fragrant lassi is calling your name. I am sure that this gulkand lassi can surely win the race to be your next favourite summer drink. What do you think? 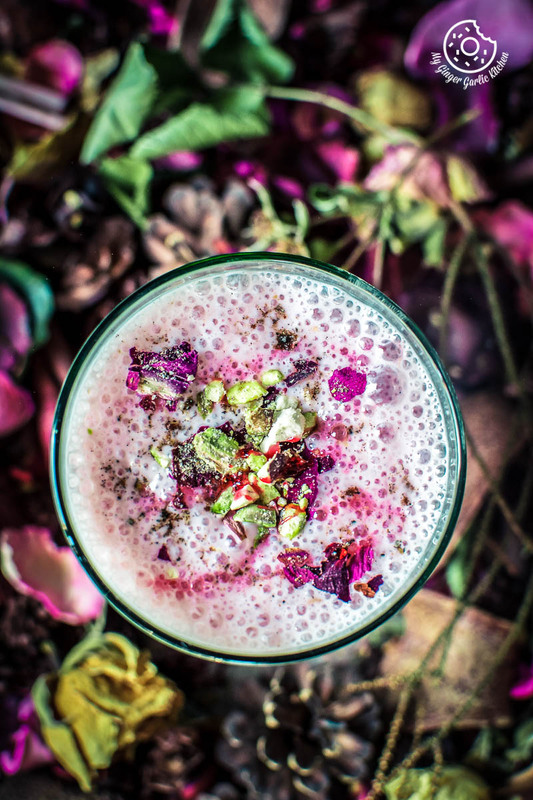 Do you wonder why, when you make any type of lassi at home, they don’t have that perfect creamy texture, they don’t taste as rich as you get in a restaurant? Sometimes homemade lassis taste bland and other times they are too sour or too sweet. Isn’t it? 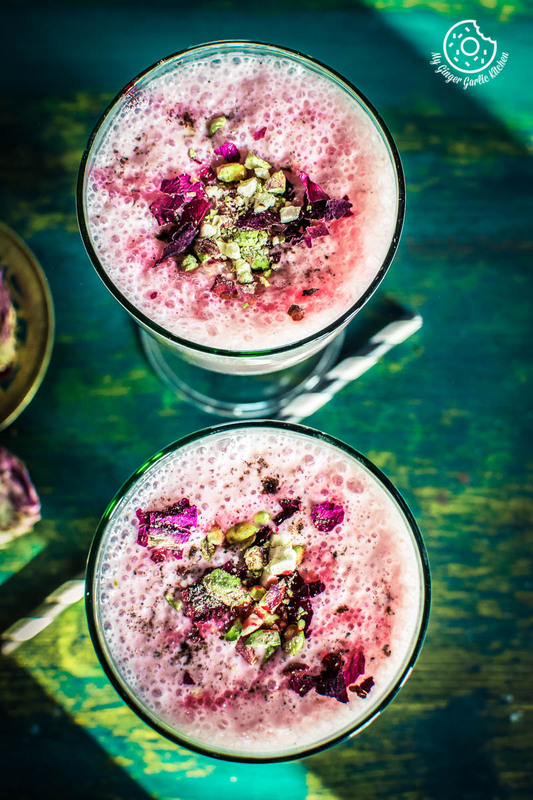 Making a lassi is one of the easiest things, but making a good lassi might be a little tricky. Well, I have figured out that there are two main reasons which can make them come out not-so-good. First, the type and quality of the yogurt which is used for making lassi. Second, the ratio of yogurt and milk. The texture of this gulkand lassi recipe is a positive outcome of a good amount of lassi-making trials and errors. Fortunately, soon enough I found the key to making a perfect, thick, rich and creamy lassi without adding any ice to it. 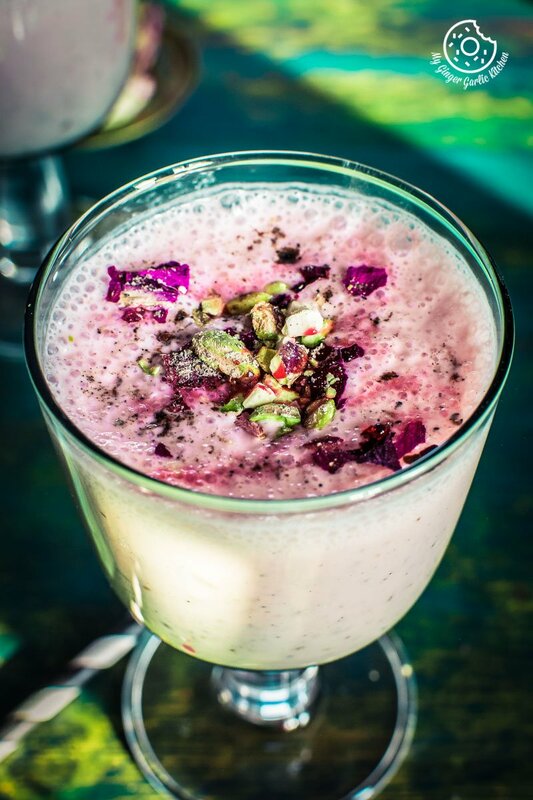 Texture wise this Gulkand lassi is exactly what have been looking for. And taste wise this is one of best lassi flavors along with these Banana Blueberry Lassi, Creamy Cappuccino Chocolate Lassi, Orange Lassi, Cherry Lassi Ice cream. That’s been a great discovery for me. I comprehended my reason that if I was after that beautiful, classic and rich taste, then I had to work a little extra hard to crack the code. 🙂 That is when I hit the jackpot. Well, it actually felt like that I’ve hit the right nerve after drinking this gulkand lassi. The key to making a restaurant-style lassi is the thick full-fat yogurt. My favorite one is Greek yogurt, but you can use any other type of thick yogurt for making lassi. My childhood was precisely spent under the abundance of homemade yogurt. My Dad never liked the store bought yogurt, so my Grandmother always pampered him by making it for him every night. Every night my Grandmother used to curdle full cream milk. In the mornings, milk magically turned into yogurt. It used to be so perfectly settled, and you could literally scoop out the slice of yogurt with a spoon. That homemade yogurt was the best thing ever. You could make anything outta it. My grandma had to make yogurt every night, because that creamy delightful yogurt was consumed by the next evening. Yogurt is a must in North Indian households. Then, the arrival of winter slightly changed the process of milk curdling. And during winter times, she first warmed the milk, then added a little yogurt, and gave it a nice mix. Then she transferred that milk to an earthen pot. After that she covered that pot with a kitchen towel and finally that pot went into the insulated keep-warm Casserole. And finally, that casserole went to the rice container. That way the milk got the perfect texture for settling. And yes, that magical yogurt was ready to be eaten in the morning. Isn’t it charming? My mom also makes yogurt sometimes, however, she uses the glass or metal containers, and her yogurt comes out just the way it should be. Many years ago, I did a couple of failed experiments of making yogurt myself, and after that I never got that spark to try it. I somehow found it too intricate. I know nothing is too complicated if done right, and I am so hoping to try it sometime. This homemade yogurt is still one of my favorite memories of my Grandmother. Summer evenings were mainly for chilled, sweet and slightly sour lassis. And it was so precious and special because it had my Grandmother’s homemade yogurt. This Gulkand lassi is the third recipe in my Gulkand recipe series. 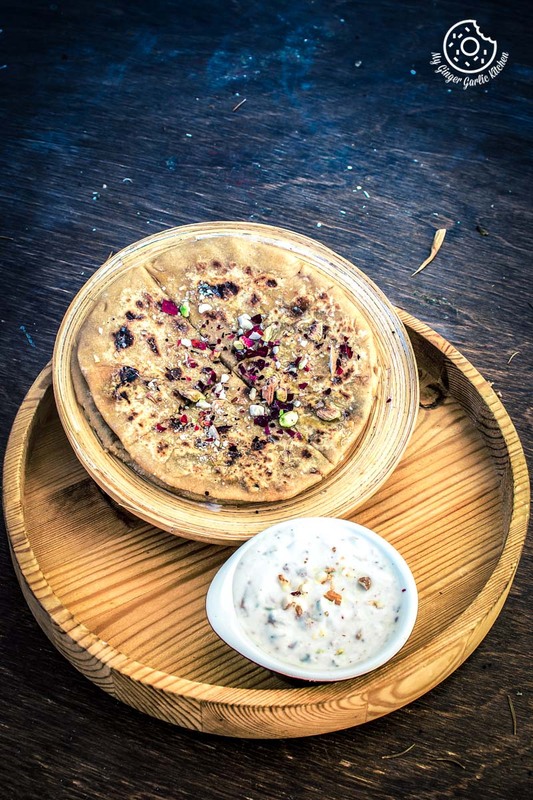 It only requires, thick yogurt, gulkand, milk, cardamom powder, rose water to enhance that rose flavor. Since gulkand itself is sweet, that’s why I didn’t add any sweetener because I personally like slight sourness in my lassis. Adding sweetener makes this lassi unnaturally too sweet, so I didn’t add any other sweetener to this lassi. But you are free to add honey or sugar to it. 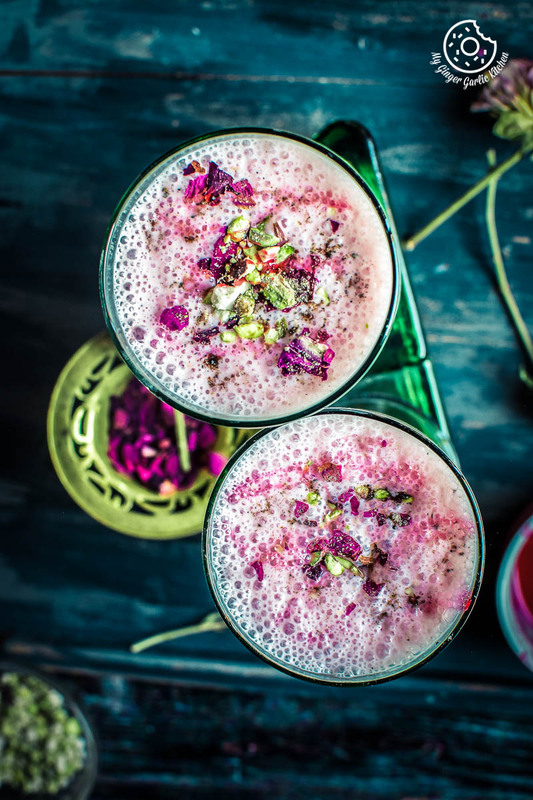 Gulkand Lassi aka Rose Lassi is a revitalizing drink. Lassi is basically a yogurt-based smoothie. I am sure that this gulkand lassi can surely win the race to be your next favorite summer drink. What do you think? 1. 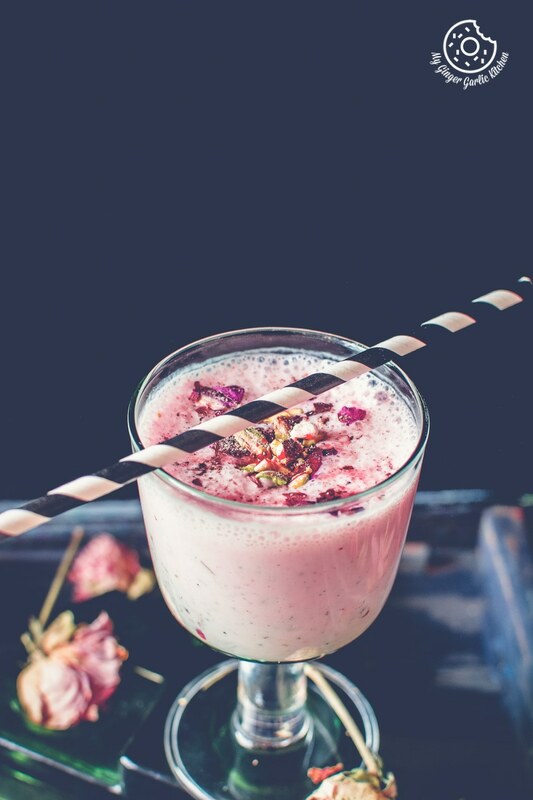 Put chilled yogurt, chilled milk, gulkand, rose syrup, and cardamom into a blender and blend for about 2 minutes. 2. This lassi is more like a milkshake consistency, but you can also add some crushed ice if you want it thinner. 3. Sprinkle with some dried rose petals, chopped cashews, and pistachios. 4. Drizzle with some rose syrup and serve immediately or keep it in the refrigerator for 3o minutes. 1. You can store this lassi for up to 1 day in the refrigerator.